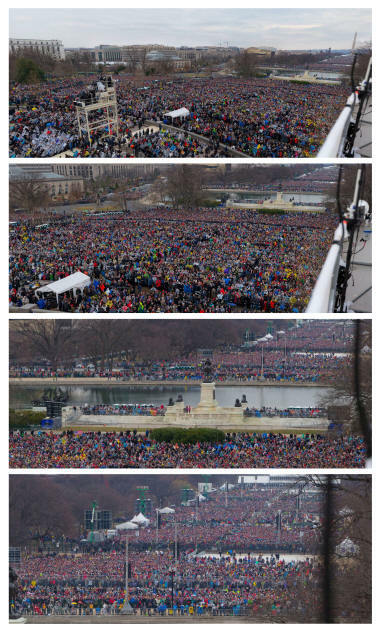 CNN aired photographs that lied about the size of Trump's crowd at his Inauguration. CNN compared photographs that appeared to show almost no one on the mall for the Trump Inauguration compared to a full mall for Obama's Inauguration. However, an online media company called Faith Family America sagely reported Wednesday that CNN's photos of the Trump Inaugural were taken early in the morning, perhaps 8:30 a.m. - before any crowds arrived. Photos taken during his Inaugural Address show a completely packed mall in front of the Capitol. I wrote an email to four CNN correspondents: Jim Acosta, Dana Bash, Dan Berman and Gloria Berger, stating: "You must apologize, and show accurate photos taken during the Trump and Obama Inaugural Speeches." "Apparently CNN belatedly, `quietly released an updated pic showing Trump's Inaugural Crowd Size Greater than Obama's 2009 Inaugural Crowd,' according to "The Gateway Pundit." However, the accurate photo comparison was not shown by CNN during prime time broadcasts on Sunday, Monday, Tuesday or Wednesday. Nor was there any response from any CNN correspondent to my email question, and no apology on air for the CNN Lies. Ironically, President Trump accused the media on Saturday of deliberately misstating the size of the crowd at his Inauguration on Friday. He called journalists "among the most dishonest human beings on earth." He said that up to 1.5 million people had attended his inauguration, "a claim that photographs disproved," erroneously stated the New York Times. However Trump complained that the news media's photographs of "an empty field" apparently showed that his Inauguration did not draw many people: "We caught them in a beauty, and I think they are going to pay a big price." No, the news media did not acknowledge that Trump was right - and its own assertions were flat out wrong. Not only CNN, but The New York Times and others who used CNN photos that seemed to show an empty mall. Sean Spicer, Trump's new press secretary asserted that Trump had drawn "the largest audience to ever witness an inauguration," a statement "that photographs clearly proved false," countered the New York Times on Sunday. Spicer said photographs of the Inaugural ceremonies were deliberately framed "to minimize the enormous support that had gathered on the National Mall," although "he provided no proof of either assertion," the Times reported. However Trump and Spicer were correct. Who proved them right? Shamefully, no major news media did so - not CNN, The New York Times, ABC, CBS, NBC. However, a tiny online publication, "Faith Family America," reported correctly that CNN's photo of Trump delivering his Inaugural Address, shows the crowd "stretched to a block from the Washington Monument." Randy Lavorante, editor of Faith Family America, charged that "CNN is trying to push the narrative that that not a lot of people showed up to support Trump. They are calling him a liar, promoting fake news." In fact, sadly, it was CNN that who was the liar, promoting fake news by continuing to show a photograph clearly taken early in the morning - not the shot CNN itself aired to the public during Trump's Inaugural Address. Trump told the CIA on Saturday, "I have a running war with the media. They are among the most dishonest human beings on earth." As a member of the news media for more than half century, I initially took offense at Trump's remarks. Sadly, however, in this instance, he was correct - and the news media has covered itself with dishonor. With one important exception. Faith Family America honestly reported the truth, and correctly criticized CNN for its false and repeated misleading information about the attendance of the public at Trump's Inauguration.